It's just days until festival and if you're anything like us, you're wondering what's for dinner, and lunch, and breakfast. Well, with many thanks to our terrific trio of food trucks, Kombi Burger, Trailer Made and Go with the Flow Crepes and Coffee, here's what's on the menu(s). So, bring the cash, eat the food. Sweeeet. And bring a water bottle to stay hyyyydrated. As the great Vanilla Ice once said, 'I'm on a roll, and it's time to go solo.' Whether your mates don't share your taste in music, festivals or Melbourne-Cup-Carnival-avoidance, or you're just up for a weekend of choosing your own adventure, festivalling solo can be really, truly wonderful. 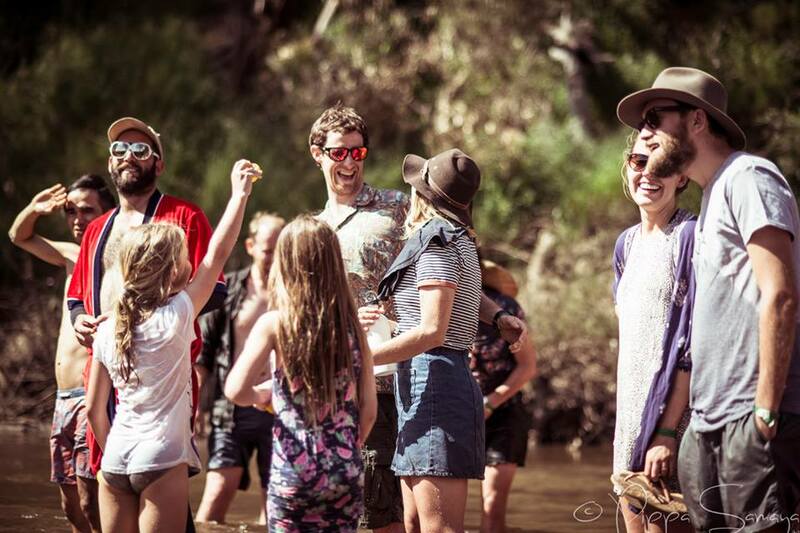 - It's a rad adventure to a place where a community springs up out of the ground for a few days - and you can wade into the thick of it or observe from the edges. - You can do exactly (ok within reason) what you want all the time. Wanna nap from 4 - 9 and party all night long? Go ahead. Want to wake at the crack of dawn for yoga, and put yourself to bed at 8:30? Knock yourself out. Want to sit under a tree just close enough to the stage to hear the tunes and read a book? Yesmaam, getit. Want to dance dance dance and hug strangers? Strong chance of a yes. Now, you're probably allll over camping and festivalling solo, but here are a few of our tips just in case. 2. Don't panic about getting your tent up solo - someone always offers to help. If they don't and you need a hand - just ask. 3. If you want to meet people you can't beat a good boogie. Head straight to the middle of the dance floor and shake it like nobody's watching. Don't know where to look? Be mesmerised by the guitarist's fingers. Too easy. 4. Want to start a conversation? "Hi, I'm X" or "Do you live close?" are fairly winning openers. 42% of conversations will die into weird silence. No worries, just say, "I'll see you around," smile, and wander off. But the 58% that don't? Whooooweee, some beautiful things have sprouted from those. 5. Take care of yourself with sunscreen, hat, insect repellant and all that jazz, drink water, eat regularly - and don't be afraid to ask for help if you need it. From smearing sunscreen onto that impossible to get bit in the middle of your back, to directions and more - festival people are some of the friendliest you'll find. Do you have tips for festivalling solo? Throw them in the comments, we'd love to hear them! With festival just around the corner and a bunch of brand-new festival kids coming along, we had a chat with Amber Hearn, who has brought her little man along to festival twice! Who wants to give away the secrets to their local op shops? Nobody that’s who. It’s a generous soul who reveals that the address for the Salvos in Google maps will take you to the mission and not the shop. Well, we just happen to be those generous souls. Besides, we cleaned out all the good Ken Done sweaters and vinyl last week. It’s a pretty simple, yet gold-mine like setup here in Benalla. Four op shops, all arranged along this easy upside-down-T-with-inconsistent-serif. Your first stop over the bridge is that secretive Salvation Army Thrift shop at 5 – 9 Bridge Street, Benalla. This place is big – super well-organised. The kind of place where the ‘good stuff’ has its own rack. But you’ll still find some hidden treasure. Toddle around the corner and you’ll find Yooralla Ballandella Op Shop at 73 Nunn Street, next to the NAB. It’s an old school storefront literally stuffed with ah, stuff. Do some digging here and you’ll find some gems. Not to mention if you get there on the right day (so far, every day) you can fill a bag of clothes for five bucks. Five bucks. That’s a denomination barely clinging to its own note. Brilliant. Head further up Nunn Street for a bit to number 41 and you’ll find the behemoth that is Benalla Vinnies. You name it, they got it. Give yourself a little bit to wander around and take it in. Now for a little power walk (or alright, drive if you must, I guess you can’t really pedal that vintage Val Kilmer framed print) over to the Red Cross at 59 Carrier Street. Do a couple of loops of that one, and you’re done. You’ve had the Benalla op shop tour experience. How do you feel? If you’re like us, you feel a little smirky for nailing such finds, and a little like you need a coffee. So then we head to One Wild Apple – coffee and tunes. Excellent. Here you go, and remember Uncle Google doesn’t know where Salvos is, but you do. ppsssst! You there! Special reward for reading this far... ;) If you happen to be in town on a Tuesday, word on the street (Bridge Street) is that the Baptist Church has a wee op shop that's open from 10am - 1pm on Tuesdays! A festival, however, is something he’s prepared to commit to. And one of the major reasons for having Happy Wanderer Festival, is to share the beautiful farm he grew up on and his own adjoining property. Every year at Happy Wanderer, there’s a duck race down the river, where wanderers cheer on their plastic pals, dogs attempt to steal them and one duck is pronounced winner, then a band wades in and plays in the river. It’s wonderful. And strange. “Anyway, it ended up being a real highlight.” Wanderers are also attached to their ducks. One year Trevor, a classic yellow rubber duck was retired. When it came to auctioning the ducks for the race, the crowd weren’t pleased. “There was someone in the crowd, that actually was heckling me, going, ‘Where's Trevor?’”, says Mark. Out of a field of 26 ducks, one little pink duck has managed to win the race two years running. The ducks were named five years ago when the directors were a little bit more rambunctious, so this fast little pink duck is inexplicably named G-string. For reasons unknown, it’s won two years running and came in at least top-five every year. 2015 winner G-string with owner Zoltan. Image: Brendan Tonkin. The duck auction helps raise funds to keep the festival running – the directors and organising committee are all volunteers, and the directors help fund the festival. Today's the day! We're announcing our Happy Wanderer 5 line-up and without getting too emotional about it - gosh wow what an... honour. Ok we said it. Thank you to each and every band that applied. We wish that time were not so stubbornly finite. Here's a list of the wonderful humans who will be playing Happy Wanderer this year - click the links, bathe in the awesomeness like we have been for the past few months. Get your tickets, because this one's going to be a dead-set doozy! With over 160 applications from talented musical folk, it's been tough but awesome whittling them down into a line-up that will get you swaying, reminiscing, dancing and jumping. There's so much fantastic talent in this country and we encourage you to get out and see as much of it as you can. Each year we've had a collection of outstanding up-and-coming and established artists across genres, and 2017 will be no different. We are very excited to share our first artist announcement with you. Get your ears around this! Let us know what you think on Facebook or Instagram. We'll be announcing another round of artists soon. Tickets have been selling quickly and early this year - we're up to our second round of early bird tickets and they're on sale at $140+bf until 31 July or sold out. These rounds have been selling out super early, so get in quick! Full-price tickets will be $180+bf.